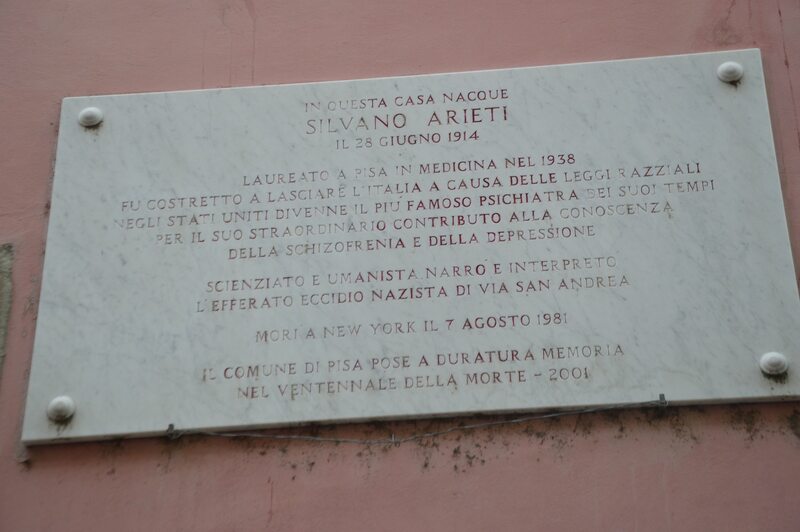 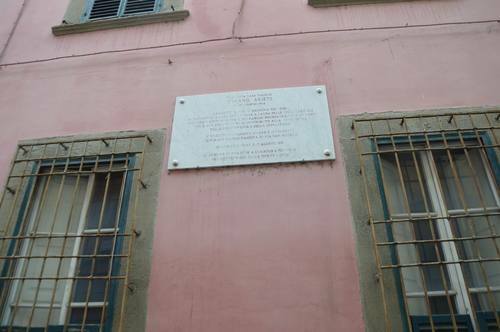 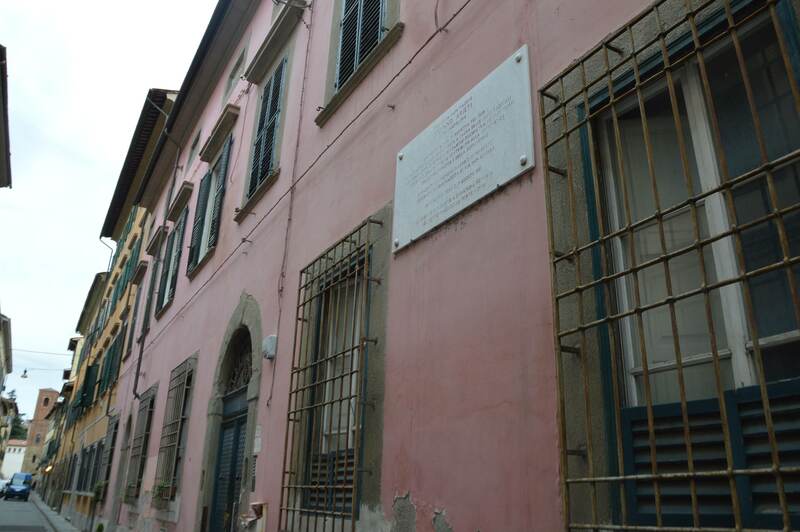 This is the house where Silvano Arieti was born, located in Pisa (via Sant’Andrea, 55), now it is a private house. On the occasion of the 20th anniversary of his death the municipality of Pisa decided to affix a memorial tablet in his honor. On the tablet we can read an Italian inscription: "IN QUESTA CASA NACQUE / SILVANO ARIETI / IL 28 GIUGNO 1914 / LAUREATO A PISA IN MEDICINA NEL 1938 / FU COSTRETTO A LASCIARE L'ITALIA A CAUSA DELLE LEGGI RAZZIALI / NEGLI STATI UNITI DIVENNE IL PIU' FAMOSO PSICHIATRA DEI SUOI TEMPI / PER IL SUO STRAORDINARIO CONTRIBUTO ALLA CONOSCENZA / DELLA SCHIZOFRENIA E DELLA DEPRESSIONE / SCIENZIATO E UMANISTA NARRO' E INTERPRETO' / L'EFFERATO ECCIDIO NAZISTA DI VIA SAN ANDREA / MORI' A NEW YORK IL 7 AGOSTO 1981 / IL COMUNE DI PISA POSE A DURATURA MEMORIA / NEL VENTENNALE DELLA MORTE-2001"
("In this house was born / Silvano Arieti / on the 28th of June 1914 / Graduated in medicine in Pisa in 1938 / was forced to leave Italy for the racial laws / In the USA became the most famous psychiatrist of its times / for its extraordinary contribution to the knowledge / of schizofrenia and depression / Scientist and humanist he told and interpreted / the cruel nazi massacre of via San Andrea / He died in New York the 7th of August 1981 / the municipality of Pisa affixed to lasting memory / on the 20th anniversary of his death-2001").